The biggest thing to watch out for is the technology used to connect the SSD to your PC. PCI-E: This interface taps into four of your computer’s PCIe lanes to blow away SATA speeds, to the tune of nearly 4GBps over PCIe gen. 3. Those sort of face-melting speeds pair nicely with supercharged NVMe drives. Both the PCIe lanes in your motherboard and the M.2 slot in your motherboard can be wired to support the PCIe interface, and you can buy adapters that allow you to slot “gumstick” M.2 drives into a PCIe lane. NVMe: Non-Volatile Memory Express technology takes advantage of PCIe’s bountiful bandwidth to create blisteringly fast SSDs that blow SATA-based drives out of the water. Check out PCWorld’s “Everything you need to know about NVMe” for a nitty-gritty deep-dive. M.2: This is where things get tricky. Many people assume M.2 drives all use NVMe technology and PCIe speeds, but that’s not true. M.2 is just a form factor. Sure, most M.2 SSDs use NVMe, but some still stick to SATA. Do your homework. Many modern Ultrabooks rely on M.2 for storage. U.2 and mSATA: You may also stumble across mSATA and U.2 SSDs, but both motherboard support and product availability are rare for those formats. Some older Ultrabooks included mSATA before M.2 became popular, and drives are still available if you need them. Speed matters, of course, but as we said most modern SSDs saturate the SATA III interface. Not all of them, though. Do you need an SSD? “Need” is a strong word, but we heartily recommend that everyone upgrade to an SSD. Solid-state drive speeds blow even the fastest mechanical hard drives out of the water. Simply swapping the hard drive in your old laptop or desktop out for an SSD can make it feel like a whole new system—and a blazing fast one at that. Buying an SSD is easily the best upgrade you can make for a computer. Intel Optane accelerates hard drives. SSDs cost more per gigabyte than mechanical hard drives, though, and thus aren’t often available in ultra-high capacities. If you want speed and storage space, you can buy an SSD with limited space (like the 128GB Crucial BX300) and use it as your boot drive, then set up a traditional hard drive as secondary storage in your PC. Place your programs on your boot drive, stash your media and other files on the hard drive, and you’re ready to have your cake and eat it too. Alternatively, Intel’s new Optane drives blend both worlds. These tiny, affordable M.2 drives are designed to pair with a hard drive in your system and act as a cache, speeding up the most-used programs on your PC. Intel’s tech can truly supercharge your everyday experience, but once you blow past the M.2 drive’s 16GB or 32GB of cache, you’re back to pokey hard drive speeds. Optane also has strict configuration and supported hardware requirements. Check out PCWorld’s Intel Optane memory review for the full details. If you’d like to know more about our best SSD picks as well as other options, the links below point you toward all the SSDs we’ve recently reviewed. We’ll keep evaluating new ones on a regular basis, so be sure to check back to see what other drives we’ve put through their paces. And once more, if you’re looking for portable storage, check out PCWorld’s roundup of the best external drives. The Sandisk Extreme Pro NVMe is a worthy competitor to the Samsung 960 Pro performance-wise, and blows its doors off on price. Top-tier performance at a budget price pretty much says it all. 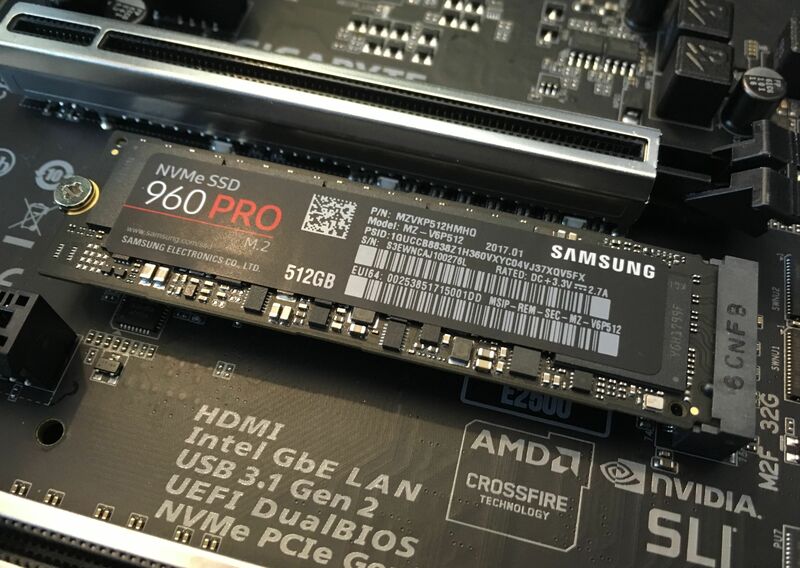 We were ready to love this NVMe SSD because of its superlow price, but while indeed it is near the price of SATA, so is the sustained write speed. That said, in everyday use, you will see that NVMe kick in the pants performance.